The Detroit Red Wings pulled off a big overtime win over the Toronto Maple Leafs Friday, but suffered an even bigger loss when star center Dylan Larkin had to leave the game in overtime while trying to chase Mitch Marner. He was doubled over and appeared to hurt his rib cage. Fox Sports John Keating reports that coach Jeff Blashill said that Larkin will miss one to two weeks with a strained oblique muscle, although the team is hoping he will only miss one week. He has already been ruled out for tonight’s game against Ottawa. Andreas Athanasiou is expected to replace Larkin at center on that line. Larkin has been a key player for the struggling Red Wings. He is having a career-year as he already has 22 goals, just one shy of his career-high and is close to being a point-per game player. In a mailbag article, The Athletic’s Joe Smith writes that Tampa Bay Lightning soon-to-be restricted free agent Brayden Point has made it quite clear that he wants to remain in Tampa Bay for a long time and the scribe suggests that the team might be best offering a five-year deal which might be the perfect compromise between a bridge deal and an eight-year pact. Both sides have agreed to put off contract talks until the summer. With 30 points goals and 65 points already in 51 games, the 22-year-old should receive quite a bump in pay when signing his new deal. The Ottawa Senators continue to be without goaltender Mike Condon, who the team placed on waivers on Oct. 31 who had and still is trying to come back from a hip injury, according to Bruce Garrioch of the Ottawa Sun. The veteran goaltender cleared waivers, but has appeared in just one game for the Belleville Senators in all that time. Condon has recently started skating and working out in Ottawa, but there remains no timetable for his return. The hope is that he can make a return to the ice for Belleville March. The team acquired goaltender Anders Nilsson to be their backup goaltender on Jan. 2, who has fared well in eight appearances for Ottawa with a .922 save percentage, meaning that Condon will have a tough time getting back into the goaltending rotation, barring injury. 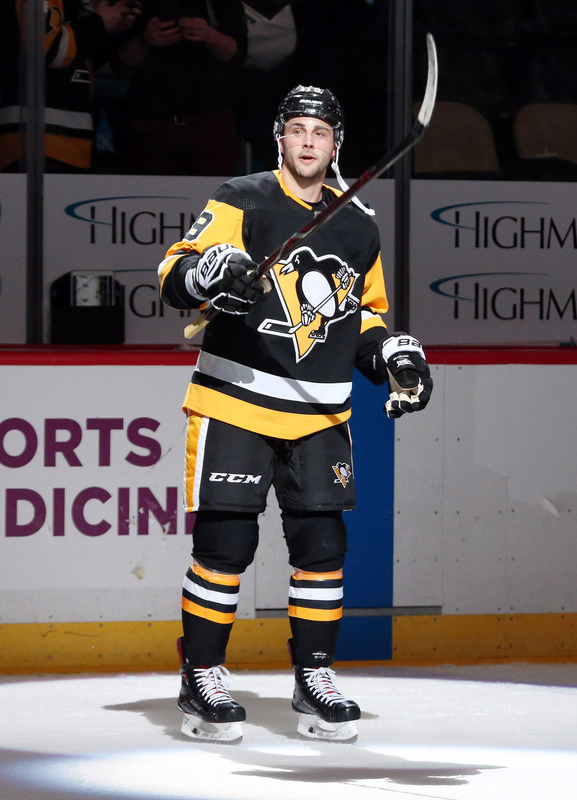 The Pittsburgh Penguins have found a taker for Derick Brassard, and filled their third-line center role in the process. The team has sent Brassard, Riley Sheahan, a 2019 second-round pick (PIT), and two 2019 fourth-round picks (PIT & MIN) to the Florida Panthers in exchange for Nick Bjugstad and Jared McCann. Neither team will be retaining any salary. Pittsburgh had been looking to ship Brassard out all season, as the veteran forward just never fit into a role with the team. Acquired last season from the Ottawa Senators, Brassard has registered just 23 points in 54 regular season games with the Penguins, and contributed just four points during the team’s early playoff exit last spring. That wasn’t enough given the opportunity he was given to play alongside Phil Kessel, and he’ll now find himself in the Florida sun for the time being. Don’t count on Brassard staying there long though, as his pending unrestricted free agency isn’t attractive for a Panthers team that is likely to miss the playoffs. Flipping Brassard to another contender could help the Panthers keep collecting picks while opening up cap space, the biggest asset they’ve gained in this transaction. Florida is expected to take a run at both Artemi Panarin and Sergei Bobrovsky in the offseason—or perhaps even sooner—and Bjugstad wasn’t providing enough to justify his $4.1MM contract. The big center has had trouble staying healthy throughout his career and has just 12 points in 32 contests this season. McCann meanwhile has 18 through 46 games but still hadn’t really established himself as a key member going forward. That’s exactly what the Penguins will hope happens for both players, as they prepare for another run at the Stanley Cup this season. Pittsburgh is now just three points behind the New York Islanders for first place in the Metropolitan Division, but will have to fight tooth and nail to hold off the rest of the group fighting for their spot. Even with the Washington Capitals and Columbus Blue Jackets on long losing streaks, all three Metro playoff spots are undecided. It’s important to note how close the Penguins have now pushed up to the salary cap ceiling, as it will be difficult to make any additional moves without sending money the other way. Pittsburgh is close to getting Justin Schultz back from long-term injured reserve, and would no longer have the room to add someone like Micheal Ferland who they have been linked to extensively. That might not matter though, as Bjugstad brings plenty of size to a lineup that was looking to add muscle for a stretch run. The 6’6″ forward isn’t an overly physical player, but can use his strength to get pucks out of traffic and create chances for himself and teammates. He’s expected to start at center for the Penguins, though has plenty of experience in Florida on the wing as well. Three picks are a hefty price to pay for Pittsburgh, given that they spent a good bit on Brassard just last year, but the team is in clear win-now mode with Sidney Crosby, Evgeni Malkin and Kessel all still able to compete at a high level. There will come a point where the team struggles to graduate any players from their prospect system, but they’ve shown in the past to be excellent college and undrafted free agent recruiters to fill those gaps. Florida meanwhile has now restocked some of the draft picks they had traded away in recent years. At one point this season they were without any selection in the second or third rounds, but now will select six times in the first four and could get even more by flipping these expiring contracts. For a team with a good young group of players and now plenty of cap space in the summer, the Panthers are a team to watch on the trade market over the next month and near June’s draft. Free agency opens exactly three weeks from today and teams are well on their way to evaluating both their own impending free agents and those likely to reach the open market. There are quite a few prominent players expected to be available as unrestricted free agents, while many key restricted free agents will be looking to sign new contracts with their current squads. Here is a breakdown of the Florida Panthers’ free agent situation. Key Restricted Free Agents: C Jared McCann – At age 22 and heading into his fourth NHL season, McCann is still a very raw talent. The 2014 first-round pick often thinks the game faster than he plays it and is prone to mistakes. He plays little special teams role for the Panthers and struggles with many of the defensive aspects of the game at the pro level. McCann is also well below average at the face-off dot. With all that said, his offensive upside is still tremendous. McCann set a career-high with 28 points in 68 games this year and for the first time was a plus player in the league. He has great vision, a strong skating game, and a good shot. When he is on his game he can be dominant; when he is off of it, it’s easy to see why the Vancouver Canucks didn’t hesitate to trade him late into his rookie year. McCann needs to find some consistency and pace to his game and he will flourish, but that still may take some time. So how should Florida handle that contractually? McCann will understandably want a considerable raise from his entry-level contract, but he also has a fair amount of developmental concerns that he continues to deal with. McCann very well could turn out to be a long-term star for the Panthers, but this situation seems far more likely to warrant a short-term bridge deal for “show me” money. McCann needs to display far more of his impressive offensive ability and far fewer mental lapses and disappearing acts if he wants to command greater salary and term. LW Frank Vatrano – It’s never an easy situation to sort out when a restricted free agent is acquired mid-season. Florida could not have asked for a better start from Vatrano, who came over from the Bruins at the trade deadline after falling out of favor in Boston. After putting up just two points in 25 games with the Bruins, Vatrano posted eight points in the final 16 games with the Panthers and seemed to fit in well in the team’s top six. Vatrano showed in his first pro season that he has a ton of scoring talent: the undrafted UMass product was the goal-scoring champ of the AHL with 36 goals in 36 games, put up another eight goals in 39 games in Boston, and even recorded eight points in ten games with Team USA at the World Championships. However, Vatrano lacks much depth to his game outside of having a knack for finding the back of the net. Injury and inconsistency over the past two years with the Bruins limited his scoring chances and exposed his lack of an all-around game. When playing with Florida’s finest, his scoring ability came back and those flaws faded into the background. However, Florida is now being asked to evaluate him on just those 16 games. Like McCann, Vatrano has not earned a long-term deal. The Panthers hope that they get the player they saw down the stretch and gave up a third-round pick to acquire, but there is also the risk he will revert to the mistake-prone, one-track-mind player he was in Boston in recent seasons. Vatrano could be an important piece for Florida moving forward but he could also have a ceiling as an elite AHLer and nothing more. Only time will tell, but because of that risk, expect Vatrano to earn a relatively cheap, one-year deal (even if it has to come through arbitration). Key Unrestricted Free Agents: None. Congratulations to Florida on entering free agency with literally nothing to lose. The team has five impending free agents and one, veteran winger Radim Vrbata, has already announced his retirement. The other four played little role in the successes or failures of the Panthers in 2017-18 and would be unlikely to make much of an impact if they were to be re-signed. Connor Brickley is the most notable name, as he recorded 12 points in 44 games on the team’s fourth line. However, Brickley spent no additional time in the AHL, simply watching from the press box for the much of the season. The 26-year-old forward was a 2010 second-round pick, but seems to have developed into a checking winger with limited offensive upside, the exact type of player that is easy to replace. The loss of fellow 26-year-old forwards Chase Balisy (8 games) and Alexandre Grenier (0 games) would mean even less. Third-string goalie Harri Sateri, 28, returned from Europe to play for the Panthers this year and performed well enough in nine appearances, but with two high-end veteran goalies in the mix, Florida hardly needs to stress over their AHL starter. Young Sam Montembeault will likely be just fine if Sateri is not re-signed. Projected Cap Space: The trade-off of having no unrestricted free agents to worry about is that you don’t have much salary coming off the books either. When you have your top five forwards, your top four defenseman, and two starting-caliber goalies locked up long-term, things can get expensive. The Florida Panthers got off to a slow start last season and narrowly missed the playoffs, but don’t be fooled: this is a solid team without a ton of holes and their cap situation reflects that. The cap ceiling is expected to rise this off-season to somewhere between $78-$82MM. At the midpoint of $80MM, the Cats will have around $14MM in space to work with. While that is a decent amount, it still puts the team in the bottom third of the league in terms of flexibility. Assume that McCann gets a substantial pay increase and Vatrano and potentially one or both of Petrovic and Weegar get a fair amount in their new contracts, and the Panthers will likely be operating the free agency market with around $8-$9MM or so in space. Is that enough to add the top-six forward that they desperately want and need? Probably, but they would strapped for cap space after that. Expect Florida to be players on the trade market this summer as a result. The Vancouver Canucks were in a strange situation this past summer when it came to extending restricted free agent defenseman Erik Gudbranson. After trading away Jared McCann and a pair of draft picks to the Florida Panthers to acquire Gudbranson the off-season prior, the big rearguard was held to just 30 games in 2016-17 due to injury. Still unsure of what kind of player Gudbranson could be in Vancouver but cognizant of what it took to get him, the Canucks gave the 2010 #3 overall pick an identical contract to the one inherited from Florida: one year and $3.5MM. Fast-forward to today, and the situation is still unclear for the Canucks. Gudbranson will now be an unrestricted free agent this off-season and the struggling squad faces pressure to get what they can for him by the trade deadline. However, even in another limited season – having missed 17 games due to injury and suspension – Gudbranson has shown his capable defensive game and, at 26, still has room to grow. So what do they do? Sportsnet’s Iain MacIntyre has an idea. MacIntyre spoke to GM Jim Benning, who made it clear that they would like to extend Gudbranson if possible. “I know he’s had some ups and downs, but until he got hurt he was playing well for us. As long as a player can play in today’s game, you’re always going to need a defencemen who can play physical, especially in our division. There’s always going to be room for a guy like that”, Benning stated, summing up the value that Gudbranson brings. However, an extension is not done yet and the clock is ticking toward the February 26th NHL Trade Deadline. If a deal cannot be struck, the rebuilding Canucks have no choice but to trade Gudbranson and hope that they get a good return for him. Gudbranson’s agent, Mark Guy, said as much in talking to Sportsnet’s Rick Dhaliwal, ackowledging that the season will likely either end with an extension or with a trade. Benning knows that his job may be on the line and needs to get whatever he can for Vancouver’s impending UFA’s. A trade also wouldn’t rule out the team simply bringing Gudbranson back in free agency too, perhaps adding to the intrigue of shipping him out in the next month. Benning may prefer to re-sign Gudbranson, but it still seems like all signs point to a trade. While Senators center Kyle Turris has been seeking a max-term contract extension of eight years, Bruce Garrioch of the Ottawa Sun reports that his camp is now aiming for a seven-year extension worth roughly $6MM per season. The team, meanwhile, continues to offer a five-year deal instead. The timing of this report is certainly interesting considering Turris was believed to be part of a recent three-team trade with Colorado and Nashville that would have had him going to the Predators but the deal fell through. Turris is poised to be one of the top centers available on the open market this summer if he makes it to free agency and should be able to land a long-term contract wherever he signs. Will this report affect negotiations between him and the Senators though? It may be difficult for Turris’ camp to return to the table knowing that the team has been recently including him in trade discussions so that will be certainly something to watch for. The Panthers will be getting some help from the infirmary tonight as NHL.com’s Alain Poupart reports (Twitter link) that forwards Jared McCann, Colton Sceviour, and Connor Brickley are all set to return to the lineup. McCann (lower-body) and Sceviour (upper-body) have each missed the last five games while Brickley (upper-body) has sat out the last three games. Florida made a pair of roster moves yesterday to free up spots on the active roster when they returned forwards Denis Malgin and Chase Balisy to AHL Springfield. Sabres defenseman Rasmus Ristolainen suffered an upper-body injury on Thursday night and is listed as day-to-day, the team announced via Twitter. He joins fellow blueliners Zach Bogosian, Nathan Beaulieu, and Josh Gorges on the injured list; through 13 games this season, Buffalo has yet to dress a fully-healthy defense corps. Ristolainen’s loss is a significant one as he is unquestionably their top defender and leads the league in average ice time per night at 27:09. Taylor Fedun is expected to take his place in Buffalo’s lineup.